Food festivals are one of the only things that can get me out of the air-conditioned cocoon. The first Indian Food Festival is shaping up to be one of the best in town. The integration of Indian food, music, dance and art is a rare mix of complementary aesthetics, and seeing it all come together in a vibrant splash of marigolds and masala is something spectacular to behold. It's an offshoot of the Downtown Yoga Festival, which has offered local yoga enthusiasts an opportunity to learn from some of Utah's most accomplished instructors for 10 years. The yoga component runs from 9 a.m.-6 p.m., and the food fair goes on from 10 a.m.-6 p.m. 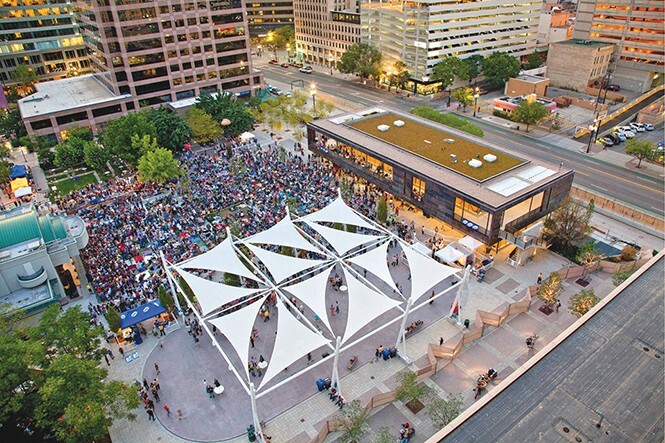 It all happens at the Gallivan Center (239 S. Main) on Saturday, July 21. Tickets to the Indian Food Fair are free, and more information can be found at indianfoodfair.com. Tickets to the yoga fest are $34.99 and can be purchased at downtownyogafest.com. Much like a wandering desperado who arrives in a small frontier town with tales of mythic adventure, chef Jeff Crosland recently made an impression on students at a Southern Utah University community cooking class. Crosland heads a new restaurant called Gather (148 N. Kolob Terrace Road, Virgin) that has opened up on Kolob Mountain deep within the red rocks of Southern Utah. Although the tale of an off-the-grid chef showing off his ceviche skills for a bunch of SUU foodies and then disappearing into the moonlight has a romantic slant to it, Crosland is a flesh-and-blood graduate of Le Cordon Bleu in Portland. He currently owns the Spotted Dog and Parallel 88 in Springdale, and Gather is his newest endeavor, preparing seasonal food with wood-fired stoves and Dutch ovens. As the place is quite literally off the grid, Gather has yet to establish any online presence, and I had to call Crosland directly to get an address. If you're in Southern Utah and need an adventure, give Gather a try—and then tell the rest of us how to get there. Looking for a way to get into the Pioneer—er, Pie and Beer—Day spirit? Then Harmons has you covered. For those looking to up their pie and beer palate, the Bangerter Crossing location (125 E. 13800 South, Draper, 801-617-0111, harmonsgrocery.com) is hosting a pie-and-beer-themed cooking class. Join chef Hanna Maag as she walks attendees through the nuances of pie-making and a sampling of local beers. Armed with these skills, attendees will be much better prepared for the onslaught of P&B festivities come July 24. The class takes place on Friday, July 20 from 6:30-8:30 p.m., with $65 tickets available at harmonsgrocery.com/classes.